The background to the pinwheels is Alicia’s Lace, one of my favorites. 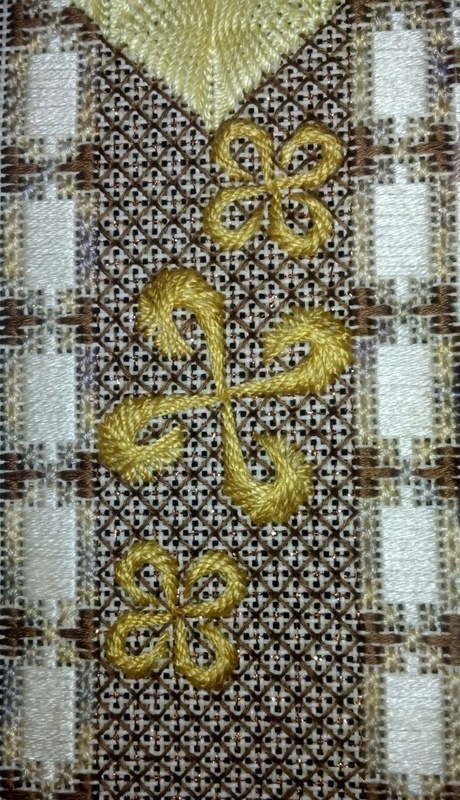 I read somewhere that basket weave or tent stitch should be added to a piece so your eye has some place to rest. In the piece, I believe Alicia’s Lace serves this purpose because it is non-directional. The x inside the diamond is a little sparkly but difficult to photograph. I used Accentuate and it is such a thin thread that it is a little tough to see even in person. I’m glad I practiced the Sprats Head because they really look nice without closing them all the way down the 2 sides of the triangle. I didn’t notice it on my ornaments until I’d stitched a couple in my practice ornament. Initially, I planned on pulling out the orange of the overdyed thread but once I stitched the Amadeus, I wasn’t happy. I confirmed this with my chapter members who suggested going towards yellow. Last Saturday, I made a trip to a Fireside Stitchery after a wonderful EGA Philadelphia Area Chapter luncheon in King Of Prussia as a guest to Carol T (ANG Apple NeedlePointer’s ). Barbara Darlin presented her extremely entertaining program revealing Victorian fashion including undergarments (http://Unlacingthevictorianwoman.com). I would love to see her other programs too! What a delightful woman & so talented (she made many of her costumes). It was so nice of EGA to open it up to guests! Thanks again Carol! And, I am so happy Betsy at Fireside steered me away from the yellow I initially selected in favor of the more golden yellows and a more subdued overdyed floss. I would have gone from too orange to too yellow. This is still yellow but not as yellow as I might have used. There are a lot of yellows to choose from! I got all the Sprats Heads done!!!! Our last ANG Mainline chapter meeting was organized so that we could practice Sprats Head & Amadeus for Pinwheels. But, not everyone is stitching that to use those diagrams so I wanted a program for everyone. I was glad to see so much participation. For those not stitching Pinwheels, members not able to attend, & any of my blog readers, I obtained the ornament directions for everything from the ANG website. You need a 4″x4″ or 5″x5″ piece of canvas & some thread. 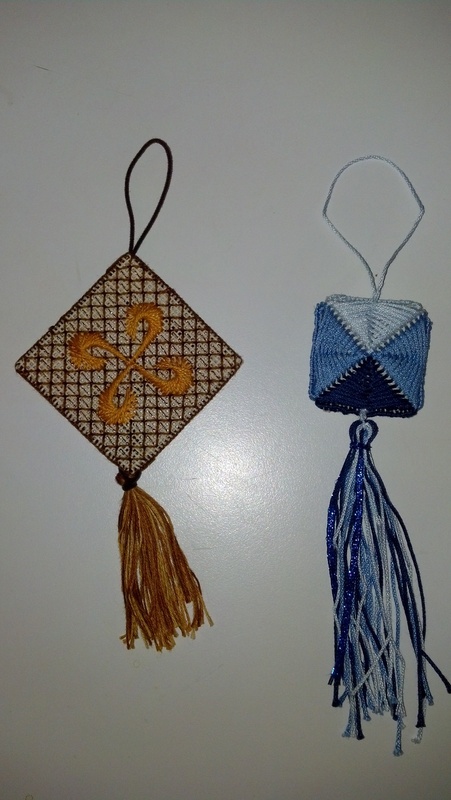 Betsy’s cord and tassel making instructions. Star in the Meadow – A Petite Stocking designed by Pat Mazu. Mine were stitched using diagrams from the Pinwheels directions. 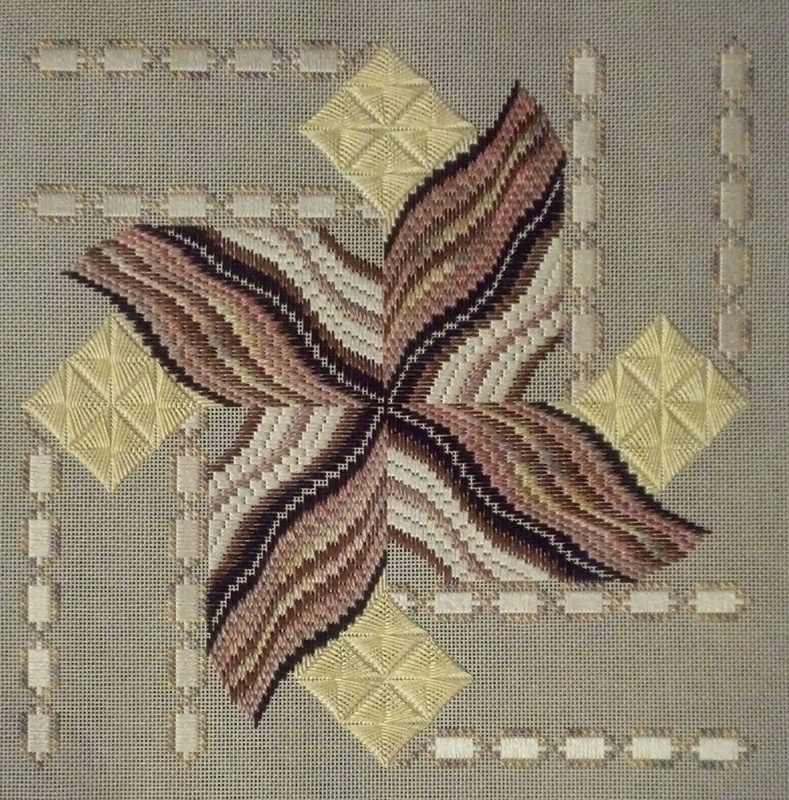 And, I used the tassel instructions from The Needlepoint Book by Jo Ippolito Christensen because I had it stitched before those website directions came out. 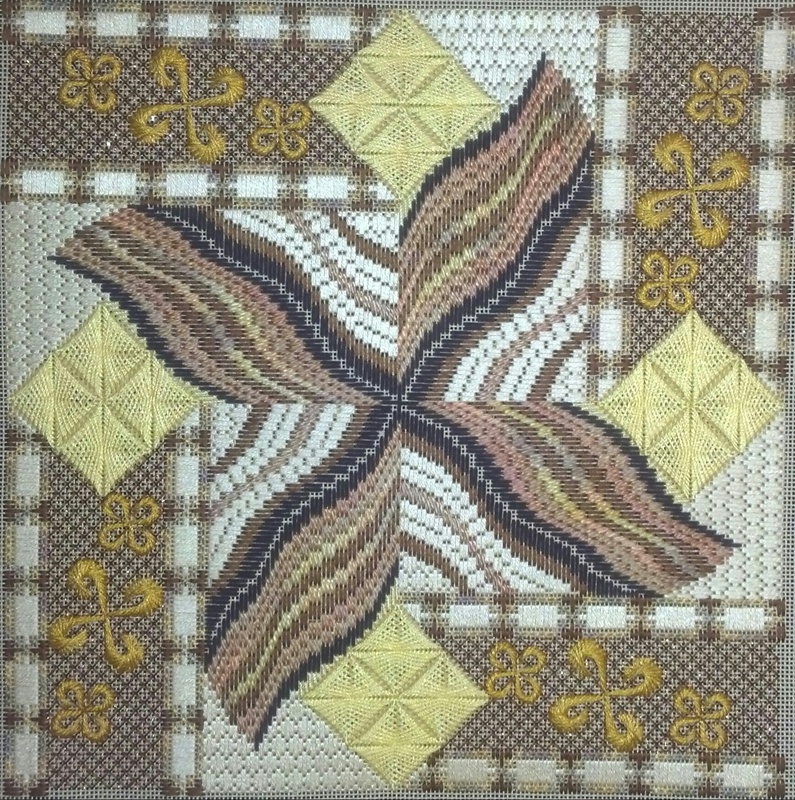 I made quick progress on the pinwheels except when I had to cut out 3 rows on one of the smaller Bargello sections when I discovered that I missed the second dark row. Oh well, cutting out is quick enough. 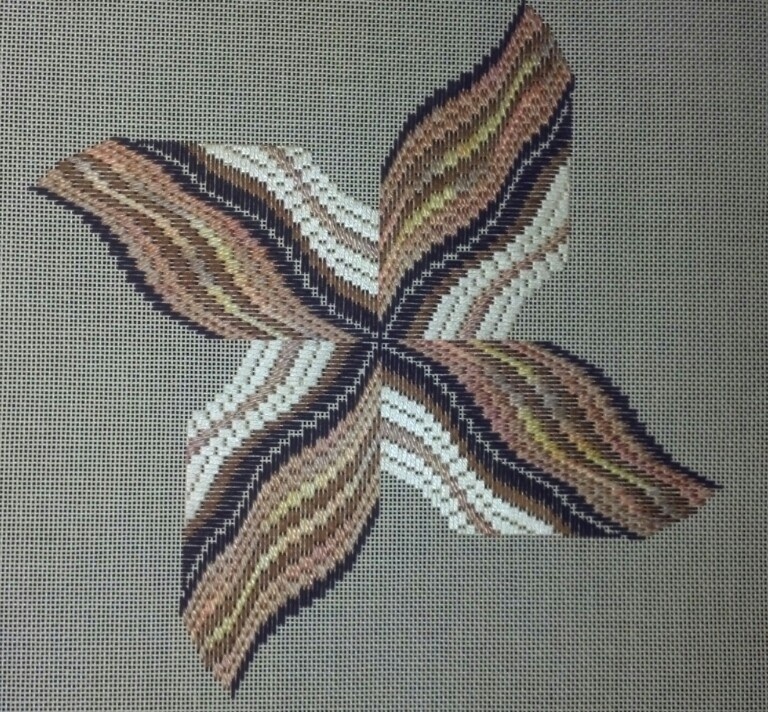 And, those rows aren’t as long as on the other Bargello section. I found it easier to write down the step pattern for the first row of Bargello as a way to keep track of where I was I stitched. 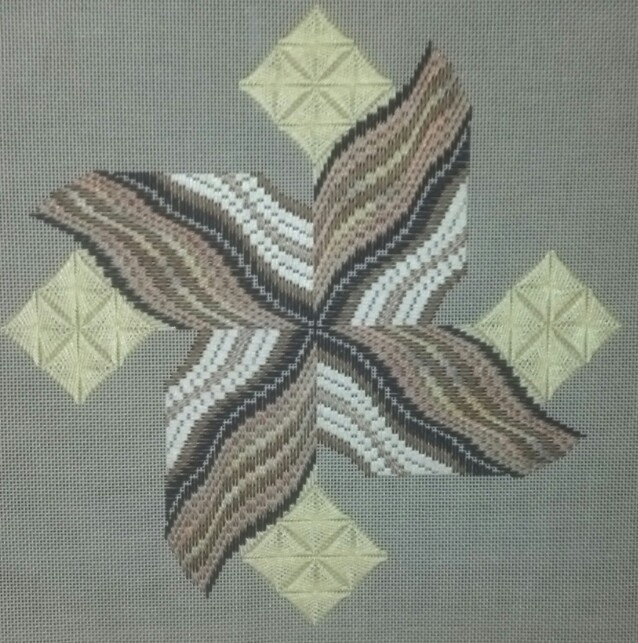 I have not done much Bargello & find the counting fraught with potential mistakes. How do you keep on track? Getting the lighting right for the picture is very tough. I think this truer to my colors than the first blog posting. 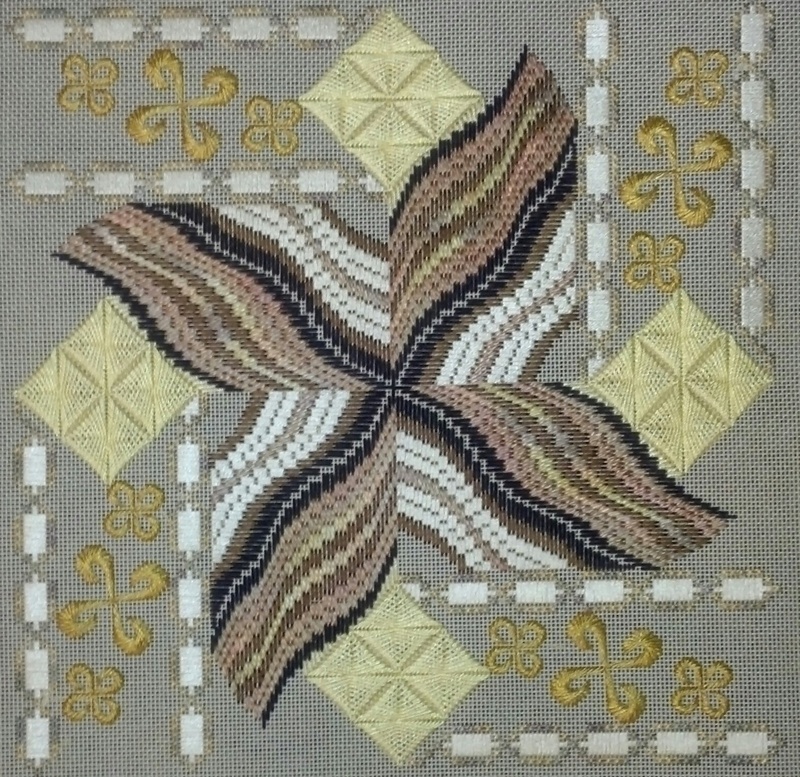 My ANG chapter, Main Line Stitchers, voted to do Brenda Kocher’s Tootsiebubbles: Pinwheels & Whirligigs. Independently, both I and Lori, our chapter President, decided to do this project. And, so we showed it to the rest of the group & everyone liked it. There are 3 color ways presented. Lori bought the green color way kit but I decided to use my stash (my husband was thrilled). But, I still ended up buying extra Watercolous and Impressions to make sure that I’d have enough. And, I needed Splendor to go with the other threads I selected. I didn’t get my fill of using autumnal colors from the Crescent River (which I am still working on because between the stitch I’m using and the fraying Water n Ice, I needed a break from the water-Thread Zap works best so far). I selected Petite Very Velvet V609 (dark brown), Watercolours 123 Spice (a minimally over-dyed brown thread) and 223 Rye (has yellow, orange, and brown), DMC Floche 433, 434, 435, 436, and 437 (a range of browns), Impressions 1106 and 1104 (light and medium orange), Accentuate 228 (brassy/brown sparkly filament), and Fyre Werks F9 (brassy/brown sparkly metallic ribbon). As Projects VP, I wanted to get started to see if there were any tricky areas. And, we’re going to practice the Sprats Heads and Amadeus stitches at a meeting and make them into a small ornament if desired. Since mid-August, I made the 2 ornaments & progressed quite far on this piece. 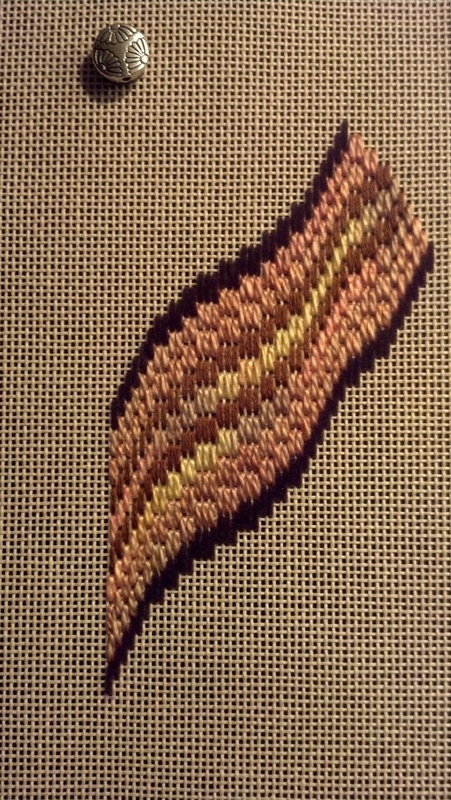 I haven’t done much Bargello before and that is what you start with in this piece. I find you do have to be careful counting. But, I have not had to unstitch much so far. You’ll see that I am only sharing the start of this piece for now – I want to surprise my chapter members& I know a couple of them read my blog!